Competition Law Enforcement and Compliance across the World. A Comparative Review is a complete and all-encompassing investigation into all areas of competition law enforcement and compliance, covering more than ninety jurisdictions. 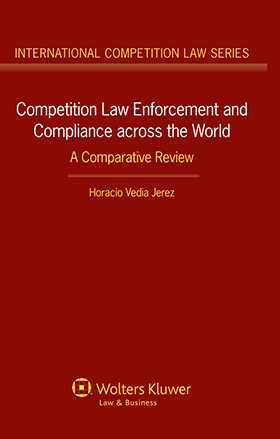 Horacio Vedia Jerez presents a detailed comparative study of competition law enforcement and compliance across the international network of competition laws. Delivering more than a guide to legislation, you’ll discover how competition law provisions are supposed to be enforced, gain valuable knowledge about both the obstacles that competition authorities’ face and the characteristics required for success in certain competition law systems which will enable you to practice in your chosen area with confidence. An invaluable feature is the best-practice guidance on the experience of countries that have succeeded in building effective competition law regimes. Learn about the potential obstacles of implementing new competition regulations with the identification of factors affecting the validity of competition regulations, including political interference and availability of resources. The balance between a theoretical perspective and the practical realization make this an important guide for all those involved in competition law, from policy makers, officials, lawyers and academics. Fulfill all your research needs with the unique breadth of coverage – in addition to legislation and case law at all levels; websites of competition authorities and extensive legal literature are referenced, saving you valuable research time. Practical guidance – contains details of the institutional frameworks and laws of each country, and focuses on how these laws are implemented and enforced allowing you to gain a true insight to guide your work. Stay up to date with the latest developments and discussions – the in-depth coverage will ensure you are able to answer any questions with confidence.